Thailand and the Thai pineapple export company Natural Fruit are continuing their judicial harassment of human rights defender Andy Hall. Andy was formally indicted Monday on charges of criminal defamation and computer crimes for documenting egregious working conditions at a Natural Fruit canning facility in 2013. If found guilty, he faces up to seven years imprisonment and millions of dollars in fines. Learn more and show your support for Andy! On International Human Rights Day (Dec. 10th) we took our concerns about the World Bank’s support of forced labor in Uzbekistan to its front door. Literally. We projected images of the Uzbek citizens forced to harvest cotton in World Bank project areas onto the World Bank headquarters building in Washington D.C. Check out the video of the action and take action to help us end the World Bank’s support of forced labor in Uzbekistan! Child labor and desperate poverty among farmers in the cocoa industry is in the news again, just before one of the largest days for chocolate sales. Want to make your Valentine’s Day a little sweeter? 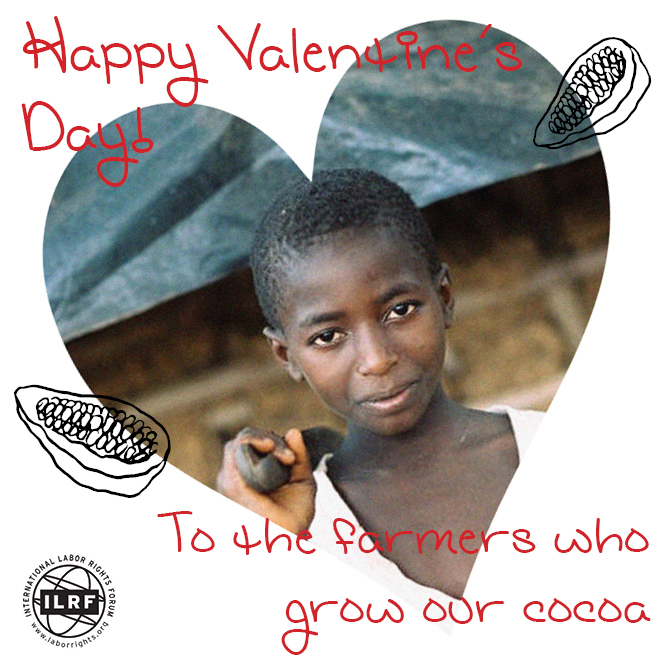 Make sure you buy your sweetie a treat from a chocolate company that gives back to its farmers. Our favorites include Divine and Equal Exchange. You can also hand out our informative Valentine’s cards to educate others and encourage action to clean up the cocoa supply chain. For months Hondurans have been in the streets demanding a UN Commission Against Impunity and Corruption (CICIH), a body that helped lead to the arrest of Guatemala’s president in September. Hundreds of activists joined ILRF's US Labor Education in the Americas Project and the Honduras Solidarity Network to encourage and support the 54 members of U.S. Congress – led by Representative Serrano – who signed a joint letter to Secretary of State John Kerry, urging him to support the CICIH and help end impunity for violent attacks against Honduran trade unionists and other human rights defenders. Since November over 75 printer cartridge factory workers in Ciudad Juarez, Mexico, have camped outside local headquarters of U.S. company Lexmark International to protest their dismissal for attempting to form an independent union. In a December 23rd letter quoted by Buzzfeed, ILRF Executive Director Judy Gearhart urged Lexmark CEO Paul Rooke to intervene and ensure respect for workers’ rights, including their right to organize. Stay tuned for how you can help support the workers’ struggle! And click here for an update from ILRF Board member Cathy Feingold, Director of AFL-CIO's International Department. Following repeated death threats and intimidation against our partner organization FESTAGRO – a federation of agricultural trade unions – USLEAP@ILRF launched an urgent action in November. Over 600 supporters generated pressure, and we’re pleased to report positive results: 30 members of Congress, led by Representatives Farr and Schakowsky, sent a joint letter to U.S. Ambassador James Nealon on Friday. The letter urges him to push Honduras to protect the trade unionists, investigate the threats, and prosecute the perpetrators. Join H&M customers, students, unions, and concerned citizens around the world in a global day of action on the day of H&M’s Annual General Meeting. More than two and a half years after signing the Accord on Fire and Building Safety in Bangladesh and committing to make its supplier factories safer, the majority of H&M’s strategic suppliers in Bangladesh still lack fire exits. Take action: Urge H&M to end the delays and ensure worker safety now! Sign up here to receive more information and to join the May 3rd actions. Port truck drivers in California, who haul imports and exports, are challenging the systematic wage theft to which they are subjected. An illegal worker misclassification scheme can leave drivers owing their trucking company money after working a full week because deductions for diesel fuel, insurance, lease payments, and new tires amounted to more than their gross earnings for the week. As a result, port trucking companies in California are liable for wage and hour violations of hundreds of millions of dollars each year. The Justice for Port Truck Drivers campaign is standing up and holding a group of retailers accountable for misclassification, wage theft and inhumane conditions in their supply chain. Click here to sign their petition! Please join Representatives Rosa DeLauro, Sander M. Levin, Jan Schakowsky, and Jackie Speier on January 26th at 1:00 p.m. for a briefing and discussion of strategies to protect workers’ right to have a say in their safety. The presentations will include the Capitol Hill launch of the new ILRF report, Our Voices, Our Safety: Bangladeshi Garment Workers Speak Out, and expert presentations on workers’ ability to secure their safety at work. Click here for further information.